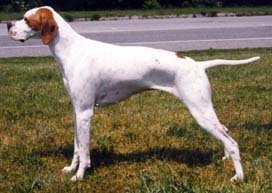 The Pointer was bred to do a specific job. On sighting a hare it would stand and point, permitting the accompanying dogs to chase and seize the animal. It has a friendly disposition and is an excellent companion and gun dog. It maybe lemon/ white, orange/white, liver/ white, or black/white. It weighs 20-30 kgs and is about 61-69 cms tall. 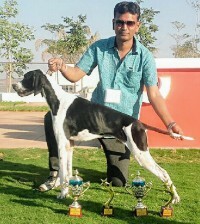 Visces Kennel Proudly Presents Top class Show Prospect English Pointer puppies. 4 Boys 3 Girls. Sire - Ind. Ch. Visces Agams Hunter. Dam - Ind. Ch. Visces Dalvis Cutie. Click Here to See Litter Box, Photographs and More details. For more info Contact: Visces Kennel, Ahmednagar, Maharashtra. Gunston Kennels - Home of outstanding English Pointers We now present a well bred litter of English Pointer puppies, eight weeks old . Sire: Gunston on the Wing. Dam: Ch.Gunston Fire Away (combing the best of Crookrise Bloodlines).